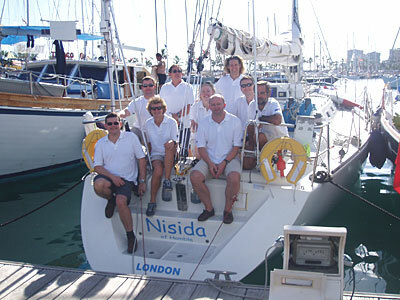 After many days of preparation, victualling and (too much) drinking in Las Palmas Gran Canaria, the time had arrived for the crew of Nisida to slip to make way for the start of the ARC 2006. Nisida, entered in the racing division, is an Italian designed GY 52 ideally set up for some fast downwind sailing, with large roached mainsail and some huge kites. Hopes were high for a quick crossing and some healthy competition against the likes of Dark & Steamy (a DK 46) and Brave (a Farr 520). Conditions were perfect for the start - sunny and warm weather with a fresh F5 NE wind resulting in a nice downwind start. There was no mistaking the committee boat end of the line, a huge ferry, but the ODM was trickier to find along the long line with many ARC and local boats milling around. As soon as we crossed the line, up went our biggest asymmetric kite and we were off - next stop St Lucia. We hadn't started the watch system yet and all the crew were keen to watch our progress against the other yachts around us and catch the last glimpse of land probably for the next 2 weeks. After three or so hours we were lying a respectable 7th, especially as the yachts further offshore had got the better breeze. Dark & Steamy were just ahead, but holding on to their lead and Brave was just about level, still we knew a lot could change over the next 3000 miles. The watch system kicked in at 16:00 with myself, Derek Shakespeare, Trudy Netherwood and Duncan Haynes in Starboard (a.k.a chocolate) watch and Hilary Cook, Trevor Davies, Rick White and John Bowron in Port (a.k.a. Biscuit) watch. Peter Hopps, the skipper, was on continuous alert! By dawn on the second day we were virtually alone with one yacht visible in the distance behind us, amazing considering there were 220+ yachts taking part in the ARC. We were making good progress as we headed south, attaining speeds of up to 12 knots when surfing down the waves - a speed that we would continue to improve over the next 14 days with Hilary holding the record by the end of the trip with a top speed of 16.8 knots. The isolation and feeling that you're all alone would be felt by the crew throughout the trip as the few boat sightings we had, resulted in much excitement and speculation as to who they were. Daily position reports sent out by email provided encouragement that there were plenty of yachts around, just not visible. An early casualty during the trip was the vang - already damaged during the delivery - but now beyond repair and so it was removed to prevent it snapping completely and damaging anything else. We replaced it with a block and tackle system more commonly seen on 15 foot dinghies, not 50 foot yachts, but it held out during the trip. We would end up finishing the journey with mostly damaged sails - 2 genoas, a kite and a broken the throttle lever, coming off lightly compared to some yachts taking part with two yachts losing their masts, one losing their boom and two yachts being abandoned. The crew on 'Y Not' definitely earned the respect of the ARC participants for sailing their yacht for 1300 miles using only sails to steer, after their rudder failed. Food on board was excellent with some interesting menus being prepared for dinner involving ingredients no self-respecting Michelin starred chef would be without - marmite and even marmalade on a couple of occasions? Yum! Still we had fresh meat for the first week, before moving onto the freeze dried chicken. After a night of kamikaze attacks by the ever-present Flying Fish we even had fried fish for breakfast. Disaster struck, however, when the biscuits ran out on day 9, shortly followed by the chocolate the next day which both watches blaming the other for over-indulging on each others preferred mid watch snack. One of things people kept asking me afterwards, was what you did to keep yourself amused when not driving or keeping the yacht ship shape. Certainly, you quickly learnt to catch up with your sleep when you could. At best you'd only get 5 hours sleep during the night, split over two off-watches. Reading and listening to your ipod were other obvious distractions. At night, before moon rise or set, was a good time to try and spot different star constellations and I now know the name of all the stars in Orion, plus a few other constellations, although for some reason we never managed to find Pegasus supposedly one of the most prominent constellations in the Northern hemisphere. Our watch also learnt several different variations of the bowline- useful. At set times each day we looked forward to receiving the position reports and also listening to Herb Hilgenberg broadcast his weather forecast on the shortwave radio. Finally hygiene became an important preoccupation. The water maker had given up the ghost before we started in Gran Canaria, so there were no freshwater showers, but with the help of a willing crew mate prepared to manually pump saltwater showers were readily available - just make sure you keep your eyes tight shut! After almost 14 days at see, St Lucia appeared on the horizon and thoughts of beer, suppressed for the last 2 weeks as we were dry boat, started to get the old taste buds flowing. Keen to make sure that we moored up before the bar shut we kept our biggest kite up, even after sun set. Previously, we'd always swapped down to a smaller, heavier one for the night time. We'd had a few squalls and broaches during the crossing, but nothing that we couldn't quickly right and get going again. So having changed into our cleanest, smartest clothes it was only right that the Atlantic through one more spanner into the works, just to remind us who really is in charge. A big squall hit (35+ knots), we broached and in the confusion the kite ended up wrapped several times around the forestay. Immediate action was called for with seven crew spending 30 minutes slowly unwrapping and pulling the kite down hoping that we wouldn't have to cut it loose. Luckily we were able to continue sailing towards St Lucia and amazingly the kite was retrieved with little damage. Unfortunately we were all soaked, but this was all soon forgotten as we approached the finish line. Poor old Trevor, in his role as Chief Engineer, spent the final few minutes in the engine compartment, ready to act as a human throttle lever so we could motor in after crossing the line. We arrived in Rodney Bay, St Lucia at 2206 having sailed 2893.9 miles in 13 days 13 hours and 26 mins. Hilary was particularly pleased as we had beaten the time taken on Innovation by 30 minutes. We were the 4th boat over the line in our class - 7 hours behind Dark & Steamy and 24 hours behind Brave and great achievement. Overall, after all times were corrected we were 8th in our class. Many thanks to Peter for skippering and keeping as safe and to the rest of the crew for helping make the trip both enjoyable and memorable - I can't wait to start campaigning on Nisida in this years Fastnet!